Villa Lago Esperanza (formerly known as Villa Esperanza) has a fantastic central location! Within walking distance to the resort centre, sandy beach and the marina of Alcudia. A selection of cafes, restaurants and shops are all at your fingertips. This villa is a perfect choice for anyone not wanting to hire a car! This delightful 3 bedroom villa has spacious interiors and a private pool. WiFi and air conditioning/heating in the bedrooms and lounge are included. In central location with 10 minutes' walk to the centre of Alcudia with plenty of shops, restaurants and bars! What's more, enjoy those picturesque lake views. Villa Lago Esperanza has the true Spanish style living. The private swimming pool is great for taking a break from the warm sun. Here you can sunbathe, enjoy a meal cooked on your brick BBQ and dine alfresco or make use of the games tables. A pool fence is available on request at an extra cost of £60. The main entrance is via the conservatory, which in turn, leads into the open plan living area. The lounge and dining area are open plan with comfortable seating, a flat screen TV, feature fireplace and a table and chairs. Patio doors from the living area open onto the pool terrace, which has views over the lake towards the other side of Alcudia. Adjacent is the well-equipped kitchen and utility room. Villa Lago Esperanza has a double bedroom, 2 twin bedrooms and 2 shower rooms, all accessed from the living space. All 3 bedrooms are brightly furnished and have ample storage space. Very close to the area of Bellevue, Alcudia, Villa Lago Esperanza is ideally located on the north east coast of Majorca. 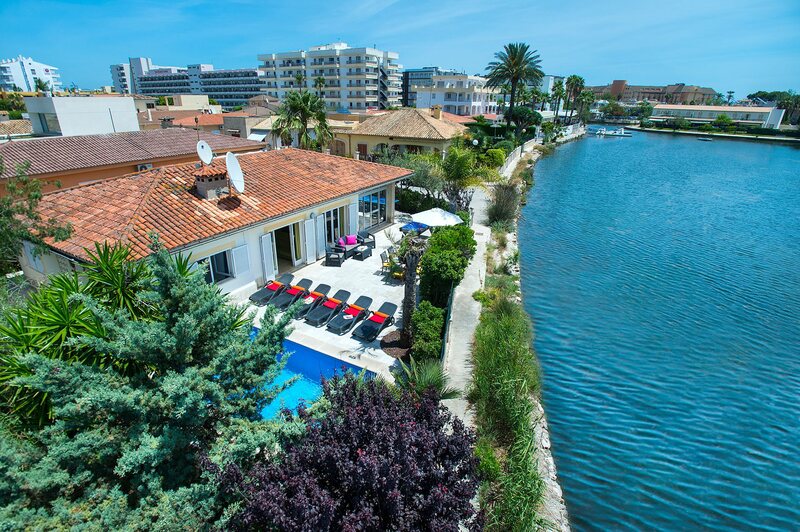 The villa has views over the magnificent Es Llac Gran Lake to one side, and the main street of Alcudia a few minutes' walk in the other direction. Alcudia has an array of restaurants, bars and nightlife to suit everyone. The long white sandy beach is also a short stroll away. The newer part of Alcudia has a number of chic shops and boutiques to browse whilst the old town has a great choice of quaint shops where you can buy souvenirs to take home. The old town is also home to a colourful market held every Sunday and Tuesday. The resort also has a lively handicraft market every night in the Marina from May to September. Alcudia's main street is a stoll away where you will find a good choice of cafes, bars and restaurants. The popular Port d'Alcudia Marina is around 35 minutes' walk from Villa Lago Esperanza, at the far end of the beach. The marina is well worth a visit for either a light lunch or evening meal overlooking the yachts. The Blue Flag Alcudia beach, fine white sand beach that stretches from Port d'Alcúdia along a 'golden mile' of the coastline. You'll find row upon row of sun loungers and parasols for hire, along with plenty of watersports for those of you who love adventure. The popular Hidropark waterpark and go karting track make a great family day out. Both are in the centre of Alcudia, within 20 minutes' walk from the villa. Alcudia Old Town is30 minutes' walk, and is certainly worth a visit during your stay. Parts of the town date back to around 1300 and visitors to the town today enter the narrow streets through one of the gates, which were constructed, along with the impressive city walls. After the conquest of the island by King Jaime I of Spain. You can even walk along the wall and admire the views over the area. You'll find a choice of water sports facilities at Alcudia Beach. You can also take a walk around the lake which has a public footpath along the waterfront. Villa Lago Esperanza is not available to book for season as it is sold out. Take a look here at the Majorca villas that are currently on sale. The western ranch Ranxo Ses Roques situated in Alcudia is the perfect place to ride horses and ponies, for adults and children, in a natural preserved territory. A family run western ranch it's open from April until the end of October. They have horses for beginners and experienced. Enjoy the unique landscape of Majorca on horseback. There is a bar, an exotic animal collection and a little shop. The villa was perfect, we have stayed in this area before in another villa with Villa Plus so we knew the location would suit us, we have a son with special needs and the walking to restaurants etc is on the flat. Nice villa with great views. Good location, near to shops restaurant and beach. Lovely villa, great views, shops & bars nearby, had a great time! Excellent, quiet villa next to a picturesque inland lake but only 5 mins walk from sea. We had a great stay at Villa Esperanza, it was in a great location, a short 5 min walk to the beach & a taxi ride to the lovely Marina. The villa is situated in a great place, with the shops, bars & restaurants just down the road, and the lovely Lake which was a great backdrop! Would stay again. Tom the rep was very helpful, thank you! villa was in excellent location, very peacefull beside the lake, handy for all the shops and bars, not far from the beach, would recommend it for anyone as alcudia is flat and you can walk to the port either along the beach path or along the road and pop into all the shops on the way it deserves a visit. This is a lovely villa over looking a lake and idea for walking to night life and shops. The villa manual provided some great entertainment due to the literal translation into English. lol Everything in the villa was really lovely and we had a fantastic time. The villa was well situated and central to all the needs of our holiday. Great setting and in the evenings we had some wonderful dining on the patio. Beach was nice and close to walk to with the kids. This villa was a fantasitc place for a family stay. Excellent holiday. Our first time in a villa and I don't think we will ever go back to a hotel/apartments again.